Providing you the best range of underground warning tape and warning caution barricade tape with effective & timely delivery. We are manufacturing Underground Warning Tape for Gas Pipe line, Electrical Telecom cables, Oil Pipe lines Water Pipe line etc from India. Our Underground Detectable Non-detectable Warning Tapes is a marker tape with top side prints warning information for marking underground buried services, which quickly warn excavation crews of the existence of buried pipes and cables before damage can occur. 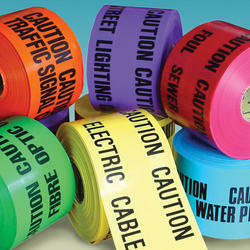 Warning/Caution/Barricade tapes alert the public to a danger zone and gives clear instruction about authority. 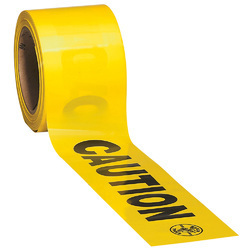 These Tapes are high-quality, high strength printed polyethylene barricade tape, can be printed with warning text / without text and Internationally recognized symbols of safety if appropriate. Available in any color, language, design or size to your specification.